The Xunlong Orange Pi Zero Plus is a small form factor board produced by Xunlong. It bears resemblance to Xunlong Orange Pi Zero. The Plus version differs from the original by having the H5 SoC instead of H3, gigabit ethernet support (Realtek RTL8211E), and WiFi 802.11 b/g/n provided with RTL8189FTV instead of XR819. The memory options are limited to 512MB of DDR3. 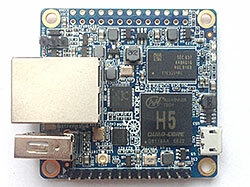 The H5 SoC support has matured since its introduction in kernel 4.12. Most of the board functionality for boards such as Orange Pi Zero Plus are available with current mainline kernels. Some features (hw accelerated crypto, hw spinlocks, and thermal) are still being worked on and the status of some features (video engine) is still unknown due to the lack of testing. For a more comprehensive list of supported features, see the status matrix for mainline kernels. Use the orangepi_zero_plus_defconfig (supported since v2018.07) build target. Use the sun50i-h5-orangepi-zero-plus.dtb device-tree binary. The Orange Pi Zero Plus has the usual 26-pin, 0.1" unpopulated connector with several low-speed interfaces. The board has another 13-pin, 0.1" header with several low-speed interfaces. A cheap 'Expansion board' for this connector is available exposing all interfaces (2 x USB, CIR receiver, microphone and combined AV TRRS jack) and can be ordered together with the board on Aliexpress. Attention: Expect problems when using the Expansion board to connect more USB devices when you want to power the board through the Micro USB connector (known to cause all sorts of troubles). Voltage drops affecting stability are likely to happen so better think about providing power through 5V/GND pins on the 26 pin header in this case. The NAS Expansion board is also a great companion transforming the 2 USB2 ports on the 13 pin header into either SATA ports or exposing them to the outside just like the above Expansion board is doing. For full USB/UAS performance you might need to upgrade the firmware of the used JMS578 SATA bridges. There's a SY8113B voltage regulator on the board able to switch VDD_CPUX between 1.1V and 1.3V and toggled by PL06 pin. This allows stable operation at 816MHz @ 1.1V (based on Allwinner BSP comments and most probably a little bit higher) and 1200 MHz @ 1.3V. The vendor OS images clock the DRAM more or less by accident with 624 MHz (/sys/devices/1c62000.dramfreq/devfreq/dramfreq/cur_freq reads 624000) but these images seem to use settings for Orange Pi PC2 without any adjustments for the device in question (16-bit single bank DRAM config) so it can be expected that this device when settings are submitted upstream will get the usual CONFIG_DRAM_CLK=672 to repeat the usual instability mess we all love so much. The one USB host port exposed as type A receptacle is usb1. Both usb2 and usb3 are available via solder holes. USB OTG available through Micro USB. This page was last modified on 7 December 2018, at 02:36.